Today on the Doc On The Run podcast were talking about how x-rays show metatarsal fracture healing. I want to remind you that if you have a running injury question that you would like answered as an episode of the Doc On The Run Podcast you can send it to me by posting your question on Twitter and tagging @myrunningdoc. In fact, today’s episode is based on a question sent in by listener. First of all Rodney thank you very much for sending in your question. I truly appreciate you listening to the show and I am sure that you’re not alone with this sort of question. The first thing I will say is that you have to commend your orthopedic doctor for looking at the x-rays with you in the first place. The truth is, doctors don’t always review x-rays with their patients. Sometimes doctors don’t even look at the x-ray images themselves at all. You may find that difficult to believe but a lot of doctors will order x-rays and then just look at the report from the radiologist. To me that really does make any more sense then not bothering to look at the house you are thinking about buying, and instead only looking at the report from the home inspector. You need to see what’s going on. And you need your doctor to explain it to you. An x-ray is just a way to take a picture of your foot. The same way an old film camera would collect incoming light and change the film in such a way that it could produce an image, an x-ray does a similar thing. Light does not penetrate through your foot. However energy in the form of x-ray particles do penetrate through your foot. But some of those x-ray particles get absorbed as they pass through your foot. The amount of absorption of the x-ray particles all depends upon the density of the tissue. When you have an x-ray you will be instructed to place your foot on top of a rectangle. In some cases it is actually a cassette with a sheet of x-ray film inside. If instead your doctor is using digital x-rays you will place your foot on a rectangular digital intensifier that substitutes for the film. When the x-ray machine is activated a beam of x-rays shoots through your foot. The particles move faster and with less resistance through the soft tissue like your skin the subcutaneous fat and the muscles. However more of those particles are absorbed when they pass through bone. The areas of the film where you have only soft tissue between the x-ray beam and the film become darker because they have more x-ray particles hitting the film. Any areas where you have bone there is less passage of x-ray particles and so those areas appear white. When you see the x-ray image you see a black and white image that looks a lot like a black and white photo of a skeleton. But X-ray images don’t just show the bone. If you look closely you actually will see an outline of the skin, the toenails and soft tissue. Trabeculation is the reinforcing ridges giving structural integrity to the bone. If you think about it from a structural standpoint, and then you look at the bone, you will see that many of those ridges form arches and other configurations that seem to resemble the structure of bridges. In many areas you can actually follow those lines the entire length of the bone. You can also see the thick outer shell of the bone or what doctors call the “cortex.” The cortex is generally thicker on an x-ray, and the cortex is brighter white. Because the x-ray is shooting down through your foot more X-ray particles get absorbed as they pass through the thicker outer shell of the bone because the cortex is like a wall or edge. When the bone is intact you can follow those lines of trabeculation and follow the outline of the outer cortex bone all the way around. When you break a bone it looks different on an x-ray. 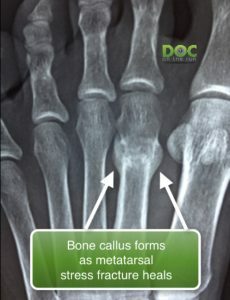 It may be helpful if you can understand the terminology and each of those changes on x-ray that doctors look for when they are evaluating a broken metatarsal bone in a runner. Lucency is a term often used by doctors to describe a dark clear space where it should be cloudy or white. 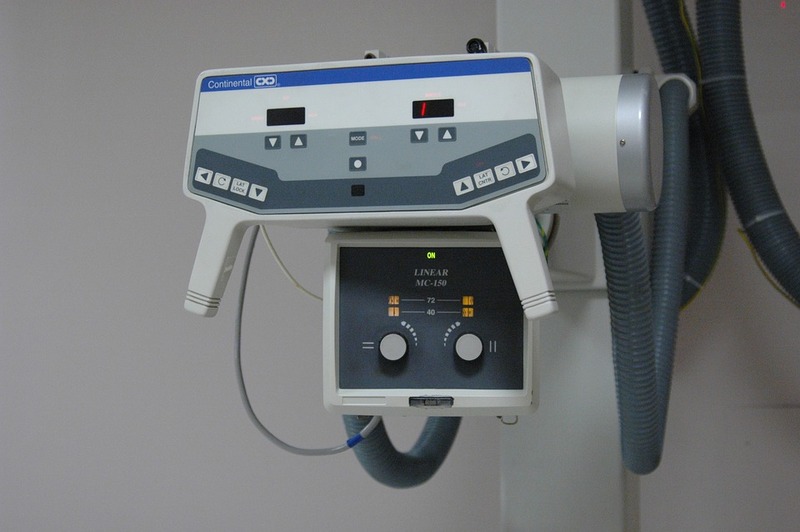 Radiolucency specifically refers to that space on x-ray. When you crack the bone there’s a gap between the two pieces. If the gap is big enough there’s a clear space where the x-rays passed right through the gap in the bone to make the film darker. So for example if there’s a crack in the bone which goes straight across and it shows up on the x-ray as a dark line, the radiologist will refer to that as a “linear radiolucency” because it is a straight dark line indicating a crack in the bone. Double density is the opposite of radiolucency. Double density insinuates that the bone cracked and shifted slightly so that it’s overlapping. So if the x-rays have to go through twice as much bone before it hits the film, twice as much gets absorbed in the bone. In that area where the bone is overlapped, the bone looks twice as white as the surrounding bone. It is whiter because there is more overlap. A step-off is just what it sounds like. If you take a round metatarsal bone, cut it in two pieces and then slide it slightly apart, there is going to be a sharp step off at the edge of the bone. It looks sort of like a stair step, hence the term “step-off”. The problem with angulation is that the bone is obviously not in the right position. If the bone is angulated or tilted away from the ground then you can assume if the bone heals in that position it’s not going to support its share of the weight once it heals and you get back to running. If the bone heals in that crooked angulated position and it’s not supporting its share of the weight, then obviously the neighboring metatarsal bones have to take over and absorb that additional stress. Of course that could put you at risk of other metatarsal stress fractures in the future. While “angulation” refers to tilting of the bone, “displacement” refers to the bones moving apart. Displacement of course insinuates radiolucency. In some respects they’re synonymous. However, if you have a very fine linear radiolucency that means you have a very thin crack in the bone and the bones probably aren’t moved apart. In that case your doctor may say that you have a “non-displaced fracture,” even though there is some radiolucency present. The farther the pieces of broken bone are away from each other, the more difficult it is to get the bone to heal. In general, displacement of more than 2 mm is a poor indicator of healing potential. 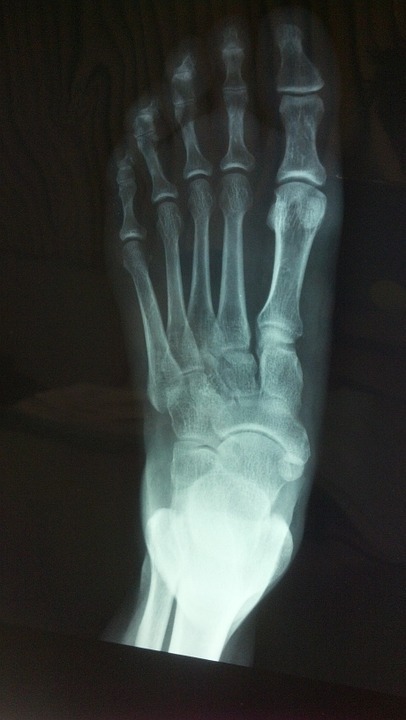 If you break the metatarsal bone and it is significantly displaced, your doctor may recommend surgery to put the pieces of bone back together to help promote healing. What changes on an x-ray image when it starts to heal? The soft callous often times can be seen on x-ray. It is very subtle. But if you look closely at the healing bone you can sometimes see a faint shadow bulging around the crack in the fractured metatarsal bone. Although this indicates the fractured metatarsal bone is in the process of healing, it doesn’t necessarily mean its stable. If you start walking on it you could rip apart those little strands of collagen. Of course, that would slow down healing significantly. As healing progresses, the soft callus starts to calcify. As calcium gets deposited into the healing fracture, it becomes white on an x-ray image. It starts to look more like normal bone. The most important sign of healing your doctor will look for on an x-ray is what we call “trabeculation.” Those lines of trabeculation are like tiny little sections of rebar the bone. Once your doctor can look at an x-ray of your foot and see these fine wavy lines of trabeculation crossing over and bridging the fracture site, we know there is a lot of stability in the bone. When does the fracture line completely disappear? Most runners seem to want to look at an x-ray of their foot and see a metatarsal bone that looks completely healed. They want that fracture line to completely disappear. If you have a tiny crack in the bone, the bone is not displaced, there’s no gap between the two pieces of bone, the bone is not angulated or tilted in any direction then it often only take 6 to 8 weeks before that fracture line is difficult to find on x-ray. You can assume that if it is difficult to even find that fracture line, you can assume there is a lot of bone stabilizing that crack. But don’t expected the crack to completely go away quickly. Think about when a construction crew digs a trench in your front yard to replace a sewer line. They dig a rectangular hole or line across your yard. They replaced the sewer line. They fill in the dirt. And they plant new grass and water it. Technically they put everything back just as it belongs. But if you look at the yard from just the right angle, you will still see where they did the work. It’s almost never perfect. And the bone is not going to look perfect on an x-ray either. But that’s okay. Be patient. You have to remember that the remodeling phase of bone healing can take up to 18 months. And although it could take several months before the fracture line disappears on the x-ray that doesn’t mean but you have to wait for that radiographic change, or that change to happen on your x-ray, before you can start walking on it or resume exercise. When can a runner expect the metatarsal bone to look completely normal on X-ray after fracture? Most runners should not expect a broken metatarsal bone to ever look completely normal. Even stress fractures that don’t show any visible crack in them will eventually develop an increased thickness or a lump in the metatarsal bone where the fracture healed. Fractures almost never remodel to the point that they look perfect. They’re almost never going to be in their original condition again. But that doesn’t mean that you can’t keep running. It just means the bone has changed slightly in its structure. If you have done everything you can to heal the bone, let it heal and fortify the rest of your system, the bone will get strong enough and you can continue running. Do I have to wait for the fracture line to completely disappear before you start running? If you take two pieces of wood, like 2 x 4’s and you glue them together, they are stable, right? But you can still see a crack between the two pieces of wood where they were glued together, right? Now, what if you drive one nail through those two boards. If you have glued the boards and you also drove a nail through them, it’s really stable, wouldn’t you think? If you have a good deal of collagen and soft callous stabilizing the fractured bone and you have a very small area of actual hard bony healing, which we see as trabeculation, across a section of the fracture, that is the equivalent to the nail and the glue holding the boards together. If the bone is angulated or tilted or displaced, there is going to be some gap between the two pieces of bone. The bone will start to fill-in where that gap is the smallest. Obviously it’s going to take longer for a bone to fill in that gap that’s farther apart. So when you look at an x-ray and you have a v-shaped gap between the two pieces of bone where it is angulated and displaced, you should expect to see some filling in of the bottom of that V where the bone is closest together. Once you get a lot of bone filling in, then the healing fracture is very stable. So even though you may have a section where there is still some gap or evidence of the fracture at the other section of the fracture line, your doctor may tell you it’s healed. So this helps us understand Rodney’s question. His orthopedic surgeon says the fracture is healed. But Rodney says he can look at the x-ray and still see a black gap where the metatarsal bone was broken. Obviously any orthopedic surgeon could see a black gap as well. But in all likelihood, the orthopedic surgeon is also seeing trabeculation on that x-ray that indicates strength and stability. So if you have a metatarsal fracture and you’re trying to decide when you can get back to running you have to ask your doctor to look at the x-rays with you. Even when I do a remote consultation for a patient over the phone, I always have them send me the x-rays, the MRI or the CT scan. I make a PDF of those x-ray images and send them back to the patient. I put little arrows of different colors in different sizes that indicate where gaps are, where I see trabeculation, where there is angulation, where there is any problem, and where there is any evidence of healing. We talk about what I see. You may get to a point where your doctor tells you it’s healed and you’re not 100% convinced because you see something abnormal. Just stop your doctor and asked questions. Ask him to explain to you what that crack means. Ask him if you can run. Be clear. Tell him exactly what sort of run you want to do. Explain to your doctor that you want to run 3 miles on the asphalt road in your neighborhood. Explain to your doctor that you really want to run 10 miles on the trail this weekend. Tell them you want to do cross-fit, run stairs or whatever it is that you think will get you back into running shape. Never take it for granted and assume your doctor understands your level of activity. Your doctor is looking at all kinds of patients all day long. Unless your doctor specializes in working with runners, don’t expect your doctor to understand the amount out of stress you are going to apply to that healing metatarsal bone. But if you are clear in your communication, you get your questions answered and make sure you get the answers you need from your doctor, you can then make a decision about whether or not it’s safe to run without the risk of re-fracturing that metatarsal bone. Make sure your doctor understands the goal isn’t just to heal the metatarsal fracture. The goal is to run.